We are one of the leading manufacturers and suppliers of high quality range of Deflector Roll that is use in many mill plants. 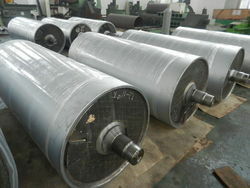 Customers can avail this roll from us in various specifications according to their needs. We manufacture this roll from the utmost quality of material & innovative techniques. 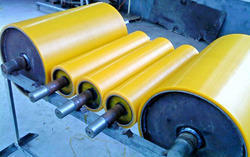 we are the manufecturer and supplyer of the Deflector rollers in all over the world. We offer our clients high quality Industrial Deflector Roll as per the clients’ requirements and in line with the international quality standards. Power Plant Services (PPS) can build oil deflectors with many different specifications for gas turbines. Being one of the trusted firms in the industry, we are highly engaged in providing a unique range of Deflector Roller. The deflector Rolls that are supplied by us are appreiciated by rolling mill globally for their high efficiency, reliability and various other features. we ensure to use raw material which are supplied by most trusted sources, The raw material undergo stringent quality test before its used for products of deflector rolls. Deflector Rolls are responsible for maintaining tension of the strip during rolling. UNI Abex has the expertise to deliver these quality rolls as per your specification and urgency. We are engaged in providing products such as oil deflectors.